Vanderbilt junior swimmer Namilla Sanchez is keenly aware of the role proper nutrition plays in performance. She feels the results each time she dives into the pool – and in her ability to succeed in the classroom. This appreciation of food’s impact, and that many in America live without reliable access to sufficient quantities of affordable food, are what drive her passion for alleviating food insecurity through addressing the problem of food waste. “I don’t understand why people should have to struggle to have food on a daily basis when there’s so much food available,” Sanchez says. The U.S. Department of Agriculture estimates Americans waste between 30 to 40 percent of food produced in the U.S. In 2010, that number equated to 133 billion pounds or $161 billion worth of wasted food. Sanchez, who goes by “Nemo,” began tackling the problem as a high school athlete, launching a nonprofit to address food waste while a student at Gulliver Preparatory School in Cutler Bay, Florida. Her passion only grew when she arrived at Vanderbilt as a freshman freestyler in 2016. A double major in communications and film, she took part in a pilot program at the university teaching human-centered design thinking to help students solve complex, real-world problems. In DIVE: Design as an Immersive Vanderbilt Experience, Sanchez partnered with a Nashville-area food waste initiative and helped streamline its processes through critical thinking in a group setting. The DIVE group ultimately helped restructure the organization’s marketing and branding efforts. Along the way, Sanchez bolstered her own knowledge of food insecurity, parlaying that experience into film classes at Vanderbilt. There, she created a three-part documentary on the subject. Sanchez’s film addressed the underlying causes of food insecurity and offered tips on how Americans can reduce their own food waste. “I learned through DIVE that if we reduce our food waste by just 30 percent and redistribute it effectively, we could take care of the 48 million Americans who are food insecure,” Sanchez said. “Documentaries are art and expression, but they’re also used as a platform to tell stories of amazing people.”In the pool, Sanchez’s skills as a distance freestyler recently helped Vanderbilt top Marshall in a dual meet on Jan. 12. The junior has grown accustomed to finding a groove in the water, lap by lap and yard by yard. Now, Sanchez says that same focus and determination has led to a love of filmmaking. Sanchez has yet to decide whether a career in film lies on her horizon. She expects to continue giving back and finding ways to impact her community – while, of course, keeping a foot in the pool. 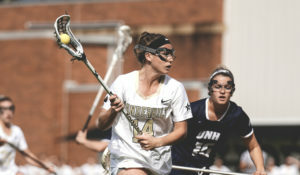 But Sanchez said she is determined to make the most of her remaining time as a student-athlete at Vanderbilt.